If you’re around the age of 24-32 then your Facebook feed is probably getting BOMBARDED with constant updates of babies, pregnancies, and couples who have just got married. Some people are bothered by it but I’m very happy for everyone that they’re taking a big step in their lives and growing up! It’s a fantastic feeling when you’re no longer just looking out for Numero Uno and have a crime-fighting partner who you can trust to take the shot when your life depends on it and who you are more than willing to take a bullet for. However, with the greater responsibility that inherently comes with the territory then the risk also increases. If something happens to you then it just doesn’t affect you but your family and others who are dependent on you. This could lead to more household/family duties for your significant other and a greater financial burden if you happen to lose your job or cannot work. The extreme case of this is when you cease to exist in The Matrix and get erased completely. The emotional expense it will take on your family is incalculable and if you can minimize the destruction in anyway then you should take those necessary precautions. One major consideration should be buying life insurance to at least minimize/eliminate the financial burden on your family. I use to think I was invincible and cannot die because I am the narrator of this story and everything would end if I died. Unsurprisingly, I’ve matured and eliminated this way of thinking and embraced the fact that my family would have to go on and suffice if anything ever happened to me. Now, I have a little girl to worry about and a significant other who depends on me therefore it was a logical decision to have a safety net in place if anything does happen to me. 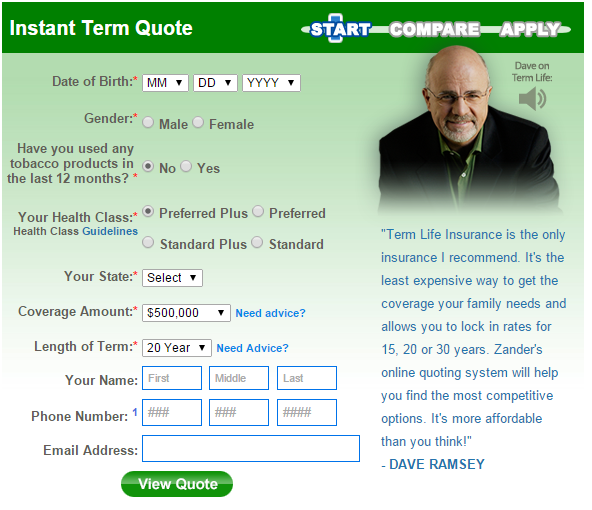 I must thank Dave Ramsey for getting me thinking about buying life insurance because I figured that I had it through my work and therefore I was covered. THIS IS NOT THE CASE! I looked at the life insurance I had through my company and it was for 1 year of my salary – after funeral expenses, that money would last probably 1-2 years. One story that he keeps telling is the husband who buys life insurance and then a few months later is diagnosed with terminal cancer. We’re all just dust in the wind and eventually we’ll be taken to a greater plain therefore please plan accordingly even though your path is undetermined.My first question when looking to buying life insurance was, “how much do I need?”. There are many opinions out there and you can Google for them however the one I used is called the DIME method. D = Debt – How much money your family will have to pay the creditors when you perish. The second question is, “what type of insurance should I get?”. The two most widely used out there is Whole Life and Term Life insurance. Whole Life provides you with a coverage amount you set and a higher premium where the additional dollars above your premium goes into an account that builds your “equity”. Dave Ramsey does not approve this method as you can make more money by taking those additional dollars and invest it yourself. Also, life insurance is not needed for your “Whole” life because as soon as you become fairly wealthy then your family should be financially stable enough to handle any money issues. Term life insurance is similar to car insurance where you pick an amount of coverage and a “term” of how long you want the insurance for. This is the one that I went with because, as I mentioned before, you shouldn’t need life insurance for the rest of your life and it provides the best option with the lowest premium. After you choose a life insurance company, a representative will contact you to set-up the health screening and paperwork process. I spent around 30 minutes answering questions with the rep about my health history, my current health status, and if I participated in any dangerous activities like sky-diving, rock-climbing, and/or battling dragons. After that initial health phone call they’ll send a nurse to your house to get blood testing completed. This wasn’t a new process to me because my company does the same thing to determine if you’re eligible for a health insurance discount. When the lab results are complete, they’ll notify you if you’ve been approved for life insurance or not. Finally, they’ll send you your policy to review and sign. Some notable notes I have from reading my contract. Overall, after (2) years your family should have no issue with getting your policy redeemed with the proof of the death certificate. The entire underwriting process takes 3-4 weeks depending what your schedule is like to get the health screening completed. If you are married, have a family, or have any other person depending on you then take this small step to ensure that at least they won’t have a financial burden upon your death. Nobody wants to think about their death however it’s a thought that needs to be taken seriously if you truly care about the people in your daily life. This entry was posted in Financial by khangn14. Bookmark the permalink.